Last night’s episode was fun, but a little overwrought. Three very important things happened: Olivia saw the writing on the wall, Mellie got SUPER drunk, and Earnest Lee “Ernie” Hudson came back into my life like a silky ghost, an eighties specter. Does he bathe in milk? Does he sleep in a coffin? Does he live underground? Does he eat the still-beating hearts of his enemies? He looked spectacular. The man surely has a portrait of his true, old, bedraggled self in his attic. Huck tried to kill Papa Pope and a woman blew herself up with a homemade bomb, but I was still kind of bored. The entire cast would simultaneously drop dead of exhaustion if all of the episodes were filled with the terse, fast-paced dialogue and tense, heart-stopping plotlines we’ve grown accustomed to, and I appreciate that this could have been Shonda Rhimes’s way of working in a break, but this is the first time I yawned through an episode. Of course Huck wasn’t going to kill Papa Pope — it’s too early in the season, and there’s no way Joe Morton is going out right now after such specific buildup tying him to Remington. Of course Mary Nesbitt was going to blow herself up — she just found out that her son was a member of Al Qaeda, held a Congressman hostage, and gave her life savings over to a woman who would take a bullet for her, sure, but would also relay the lie about her son’s death that pushed her over the edge. And what did we think of Olivia ripping back that curtain, making sure the sniper targets were pointed at her head instead of her client’s? She’s certainly not invincible — this season alone we’ve seen her get mugged, choked, and blown back by the bomb — but I’m starting to agree with David that Olivia might have kind of a death wish. 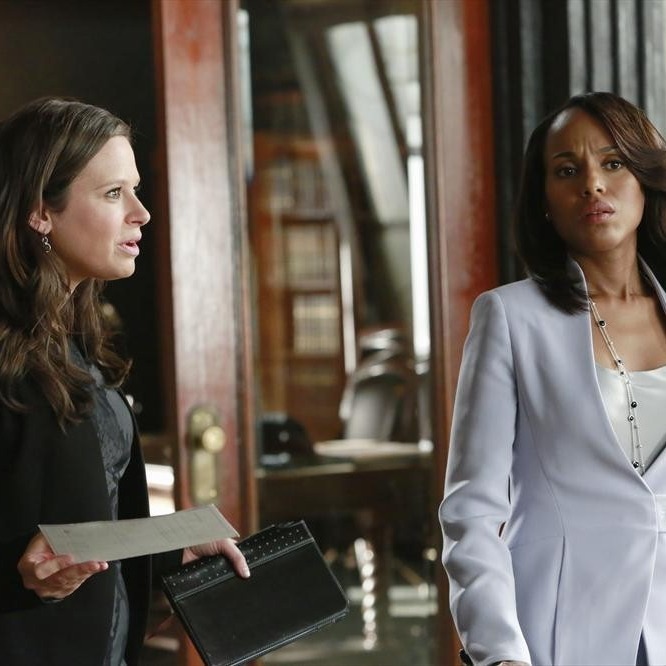 On the surface, it was a smart move, a way for Fitz to see that she was both in the building and in control of her client, but there’s a stubborn toughness about Olivia that borders on dangerous. The tension of the show is that no matter what, Liv and Fitz must act out a hierarchical power struggle, even in times like these when it’s not even about them. I like that we’re slowly unraveling Quinn’s deep descent into hacking. The flippant comment last week about her breaking into Olivia’s e-mail revealed her to be capable of high-level intelligence work and showed us her quickly shifting moral base, so it’s no surprise that this week she hacked into Nesbitt’s bank account “because she could” and was tasked with busting into the FBI database. She wasn’t able to bust into the FBI, but it prompted her to examine Huck’s computer to find out where he might be, and I think it shocked her to see that he was “obsessed” with Olivia’s dad. For all of Huck’s prowess, he’s still a deeply damaged killing machine, and as skilled as Quinn might be as a “baby Huck,” she’s still a bit green around the edges. Huck is “all killed out” after Papa Pope left him the “gift” of the OTHER White House intruder, the guy who was running to get to Fitz before getting tackled by the Secret Service and let go by Cyrus, handcuffed to a table. Mr. Gravel Chords had something to say about Remington, but Cyrus and Eli shut that all the way down. So far all we know about Remington is that it freaks Cyrus out, Jake was involved, and each week someone is going to pop up with another piece of the puzzle. Maybe it’s because the show has been so great about building tension while pushing narrative forward in the past —who killed Amanda, who’s the mole, what really happened to Quinn — that I’m finding this Remington stuff excruciating. They really haven’t given us a reason to care yet, so it’s just a keyword signaling something to come. In the end, Huck is devastated to learn that Papa Pope still controls him. When Olivia thinks about it, Papa Pope is the voice of doubt in her head, the reason she can’t trust or get close to a lot of people, and definitely the reason she launched into a paranoid line of questioning about why Jake was really set free and was it to spy on her? Suddenly, she realizes that despite her best efforts to keep him at arm’s length, Papa Pope still controls her, too. +100 points to Jake for telling Olivia her face saved him from the crushing isolation of the Hole. –80 points, though, for completely glossing over the routine and savage beatings. You showed up on her door looking like a bruised apple! Sure, your bruises somehow manage to bring out the green in your eyes even more, but you can’t just ignore the fact that you look like the side of beef Rocky used to practice on. Part of the reason she can’t trust Jake is that he never reveals the real business end of things. +4,255 points for Baby Teddy’s middle part, and a look that already says “get me away from these people.” The more Mellie and Fitz talk, the messier Baby Teddy gets, so a secret +1,000 points will be awarded for the killer use of the metaphor showcasing the rotting state of Mellie and Fitz’s marriage. +200 points for casting Duck from Mad Men, even in his tiny role as a congressman. –684 for continued misuse of Harrison. What was with his dialogue this week? “Not cool. You’re going to get a very bad rep in the hostage-taking community!” The HOSTAGE taking community? Abby: Baby Huck is choking! Did you try sending a virus worm to the firewall or IP thingy? Quinn: Do you even know what you’re saying? Mellie is in a loveless marriage to the most powerful man in the world, but she refuses to go down without a fight, and I don’t know how you can watch this show without being a little bit on her side.